Workout Smarter in this Blessed Month, Guys! SUMMARY: A lot of Muslim men are confused how to approach fitness in Ramadan. Many either quit their workout routine, resulting in losses of consistency. Others try to muscle their way through the month and get disappointed when they don’t see the progress they’re looking for. In this article, experienced personal trainer Belal Hafeez shares his 3 top strategies for men’s fitness during Ramadan! Ramadan is the perfect time to workout. Regardless of if you are a consistent gym goer or someone who is just starting out, the blessed month is great for allowing you to build a strong foundation AND maintain high energy for worship. Yes, working out should not be your #1 priority in Ramadan – this blessed month is a time to come closer to Allah ﷻ. But viewing your workout as an essential accessory to enhance your ability to reach your full spiritual potential allows you to set your intention for success! In Ramadan, you will face unique challenges when it comes to working out. Ramadan forces you to take a step back and focus on the fundamentals and build a strong foundation. You can’t exert the same amount of intensity that you would during the rest of the eleven months simply due to the lack of hydration and food. So you need take a controlled and focused approach during this month. However, don’t feel discouraged. The challenges in Ramadan don’t mean you can’t have a good workout, it just means you need to control the level of intensity. For most men, this is tough, as most guys have the ‘go hard or go home’ type mentality. As an experienced personal trainer, I’m not a fan of that saying, as it could do more harm than good even when we’re not fasting. I prefer a more consistent and controlled approach for long-term gains. So we can take this month to refocus on how to build ourselves up correctly. If you stay consistent, you can get stronger during this time. Strength and muscle development aren’t the same thing. Strength is easier to develop during this month however building muscle can be tough. You won’t really have the energy to focus on the volume needed to build muscle. However, it is a great time to lose weight and build the anatomical adaptation needed for the rest of the year to be a strong and healthy one. Remember, fitness is not a short-term journey. The benefits of this month will make it a lot easier to put on muscle in the next. So being consistent in this month will be crucial in your journey. Mobility is key to getting stronger and having happier joints. Unfortunately, most people walk around stiff like beef jerky. It’s important to give it the due respect and focus on mobilising our hips, ankles and shoulders. Mobility work isn’t something most people like to spend time on because it’s not the most intense and exciting, but it is important. You can add it to the beginning of your workouts and you will notice the difference in your movement and strength at the end of the month just by simply improving your mobility. Below is a quick routine you can try out. It may be tough to go through all at once, so it’s perfectly fine breaking down each movement into separate ones and focusing on getting better at it. Stability is key in helping prevent injuries. It will help you stay strong and functional throughout everyday life and/or while playing sports. Stability is the key ingredient to a healthy body. The majority of people that have knee pain don’t have a bad knee, it’s usually a hip or ankle problem that is causing the knee pain. So you covered how to mobilize the knee above, now you need to focus on building strength to keep you stable. Below is an exercise that will greatly improve your range of motion within the hip and help strengthen your lower body. The exercise in the video is called cossack squats. To do cossack squats, get as low as possible without compromising your form. Depending on your mobility, you may not be able to go all the way down and that is acceptable. You might have to start almost standing up and going side to side. You’ll know you can’t go any longer based on your back staying straight. If you start to notice your back rounding, stop and decrease your range. During this month most gain weight because of two reasons, increase in calories and lack of physical activity. Unfortunately, most become pretty inactive during this month due to the long fast. One really important reason to make sure you’re working out/staying active is that you will actually get a boost of energy from the activity. It will get you energized for the rest of the day and even help you with focus and concentration. Plus, staying active during this month will help make it easier for the rest of the year. Remember, working out doesn’t mean you have to be inside of a gym. You can take the kids to park, go for a walk or anything else that you will find enjoyable that will keep you consistent during this month. Focusing on these 3 components will assure you stay healthy, get stronger and build off this month for the remaining eleven months. This is an ideal time to strengthen your core. To help you out, I’ve prepared a free core workout routine that you can do multiple times throughout the week. To get my free core workout routine video, click here! 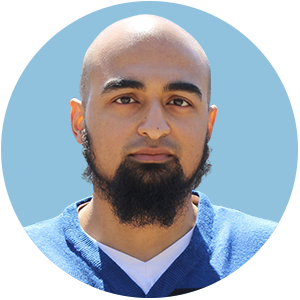 Belal is an experienced functional fitness trainer passionate about making it easy and simple to become stronger. His certifications in program design, strength training and mobility help countless clients reach their strenght and fitness goals. Click HERE to get Belal’s free core workout routine video! What types of exercises are best during Ramadan? Fasting Workouts Explained!